Imtiaz Ali, is known for creating great entertainers and his movie with Ranbir Kapoor is no exception. Tamasha, which stars Deepika Padukone, Ranbir Kapoor and Javed Sheikh in the lead roles, is a saga of adventure and romance. The movie, which once again brings together former real-life lovers Ranbir and Deepika, was released in theaters on 27th Nov 2015. Ved played by Ranbir Kapoor is a free spirited and nomadic person, who is enchanted by love stories and has grown up listening to them. His life takes an unexpected turn when he meets Tara, played by Deepika Padukone, the emotionally agile, witty and eloquent girl who loves the cartoon character Asterix. Tara and Ved fall in love while exploring the beautiful trails of Crosica and Ved comes up with an idea of making their love story unique. The two enjoy each other’s company without revealing anything about their true identities and by only telling lies. As their journey in Crosica comes to an end, they promise never to meet again. What remains to be seen is whether the lovers can shape their destiny as they want to? Tamasha is a movie that is meant for the classes. It is a journey of self discovery that reminds the audiences to not settle for something that others want them to be but rather bring out that special something in them and be who they really are. Ranbir and Deepika have done full justice to their characters who have the entire world as their stage. The music by A. R. Rahman is already topping the charts and enhances the beauty of the movie. 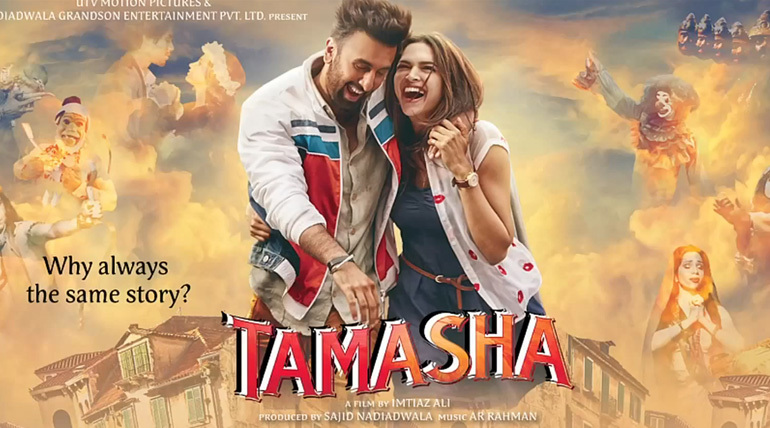 Overall, Tamasha is a good movie to watch especially if you are looking for something different than the usual run of the mill love stories and IndiaCafe24 gives it a rating of 3.5 stars.